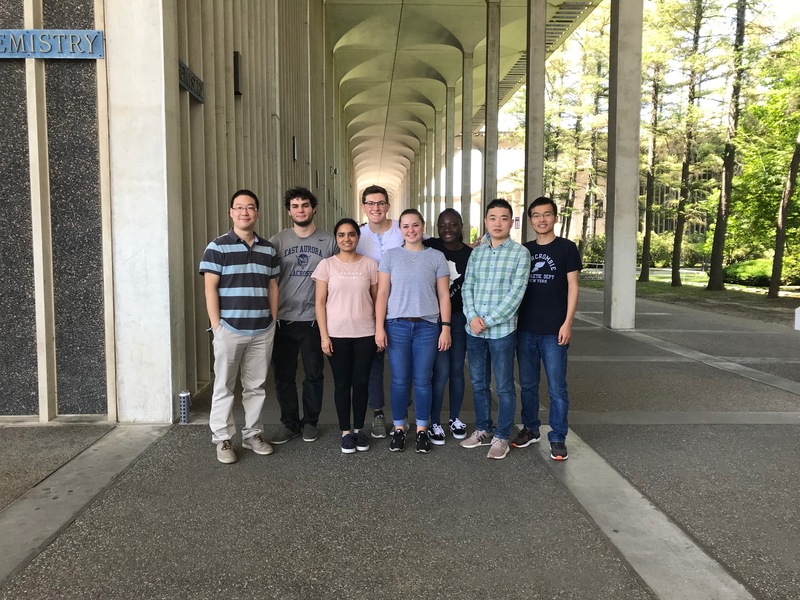 Welcome to the Wang group at UAlbany! February 2019: Jessica Andras joins the group to do undergraduate research on photocatalysis! Welcome! December 2018: Kui and Lushun's paper was published on Angew. Chem. Int. Ed! Congratulations! November 2018: Ting was selected as one of the 2019's Thieme Chemistry Journals Awardees. November 2018: Gaoyuan's photoacid catalysis paper (ACIE, 2018, 57, 6120) has been highlighted in Angew. Chem. Int. Ed. https://doi.org/10.1002/anie.201811102 ! November 2018: Charles Huang joined the group to do undergraduate research! Welcome! October 2018: Sarbjeet, Gaoyuan, and Evan's paper was published on Organic & Biomolecular Chemistry as part of "New Talent Themed Collection"! Congratulations! September 2018: AJ Silvestro and Roma Tarar joined the group to do undergraduate research! Welcome! August 2018: Juncheng joined the group. Welcome! August 2018: Sarbjeet presented her work in 256th ACS national meeting at Boston! July 2018: Grace presented her research at UASRP Research Symposium. Great job! July 2018: Grace presented her research at Undergraduate Research Conference (University at Buffalo). Great job! June 2018: Kui and Yuliu's paper was published on Chemical Communications! Congratulations! May 2018: Jessica Hayes joins the group to do undergraduate research on photocatalysis! Welcome! May 2018: Kui and Sarbjeet's paper was published on Synthesis as part of the Special Topic "Modern Radical Methods and their Strategic Applications in Synthesis"! Congratulations! April 2018: Dominic received the Larry Snyder Organic Chemistry Award! Congratulations! April 2018: Evan presented his research at Undergraduate Research Symposium (SUNY-Albany). Great job! April 2018: Yuliu's paper was published on Synthesis as part of the Special Topic "Photoredox Methods and their Strategic Applications in Synthesis"! Congratulations! April 2018: Grace received UASRP award to do research in summer! Congratulations! March 2018: Gaoyuan's paper was published on Angew. Chem. Int. Ed! Congratulations! March 2018: Dr. Lushun Wang joins the group. Glad to have you on board! January 2018: Grace Essilfie-Bondzie and Dominic Luciano join the group to do undergraduate research on photocatalysis! Welcome! October 2017: Jiyeon presented her research at Undergraduate Research Symposium (SUNY-Albany). Great job! October 2017: Kui and Yuliu's paper was published on Organic Letters! Congratulations! June 2017: Gaoyuan and Sarbjeet's paper was published on Organic Letters! Congratulations! February 2017: Jiyeon Lim joins group to do undergraduate research! October 2016: Timothy Stock and Evan Busch join group to do undergraduate research on organic synthesis! September 2016: Dr. Yuliu Du and Dr. Gaoyuan Zhao join the lab. Glad to have you on board! August 2016: Sarbjeet Kaur is now an official member of the Wang lab. Welcome! May 2016: Congratulations to Daniel Conley, UAlbany class of 2016! March 2016: Daniel Conley joins group to do undergraduate research on peptide synthesis! Feburary 2016: Dr. Kui Wu joins the group. Glad to have you on board! January 2016: Our group website is live!